The band’s first live performance, on Gala Night at Tradfest, Dublin in January 2018 was a roaring success. While the 20s era was covered very successfully by Frankie Gavin and De Danann with their 1989 album Star Spangled Molly, the greatest hit record of any Irish music act, the Roaring Twenties Irish Orchestra will revive that extraordinary era once again with their new recording and the string of performances that will follow. Their album, By Heck, was launched in Waterford’s City Hall with a formal reception by the City Council and the Mayor of Waterford, followed by a performance of the music from the album. The album is available from the band’s gigs or here. 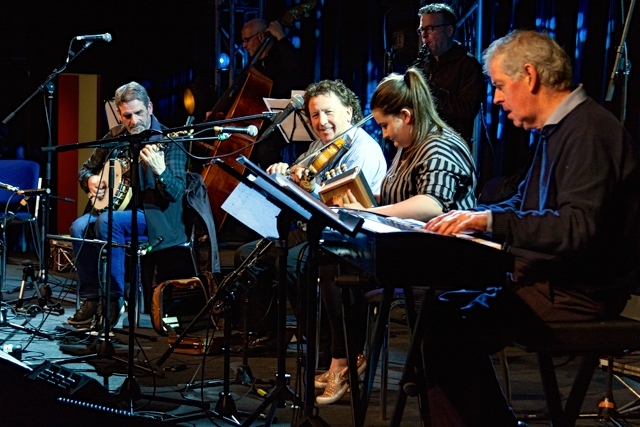 The main quartet, left to right above are Martin Murray (banjo), Frankie Gavin (fiddle), Emma Corbett (melodeon) and Carl Hession (piano). [Photo Karl Leonard copyright is AniarTV]. Other musicians on the night included clarinet, double-bass and a brass section comprising four trumpets. 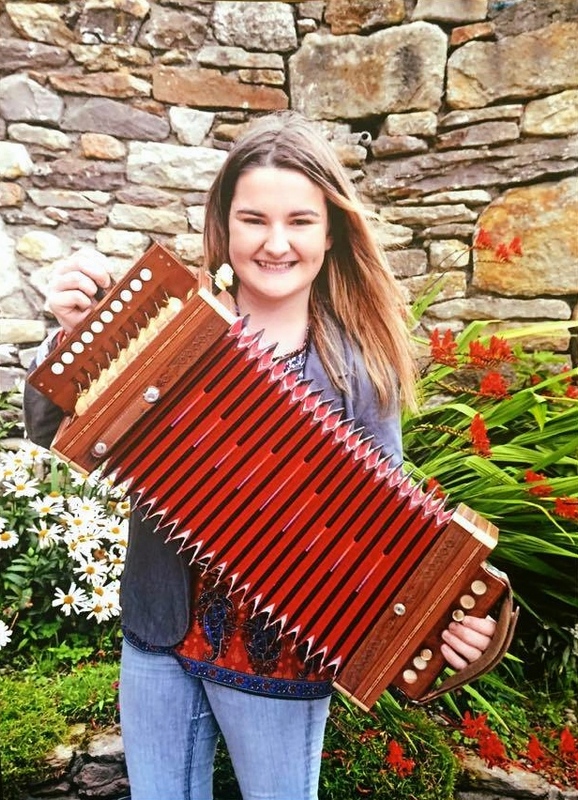 Emma is a melodeon player from Ballymacarbry Co. Waterford and is a former student of Bobby Gardiner. She was All-Ireland Feadh Cheoil champion in 2012, 2015 and 2016. She has toured Ireland with the group ‘ Macalla na hÉireann ‘ and is a regular performer with ‘Brú Broú ‘. In October 2017, she performed at ‘The Ireland funds ‘ gala in Boston at which $1.6 million was raised. Her main influences have been Bobby Gardiner, Johnny Connolly and P.J. Hernon and melodeon player extraordinaire P.J. Conlon to name but a few! Emma plays Beltuna melodeons in D and E Flat. She is also a music teacher who gives private lessons and works with several comhaltas branches. Her family owns and runs Lonergans Bar in Clonmel where regular sessions are held. Emma is soon to begin studying theoretical physics at Trinity College. From County Tipperary, Martin Murray is a highly respected instrumentalist and sound engineer. 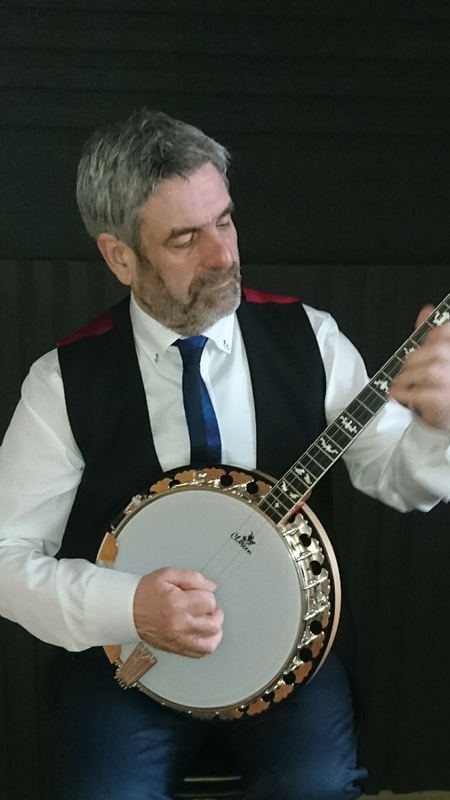 He played banjo, fiddle and mandolin in many bands throughout the 1980s and 90s, including Mairtin O’Connors Chatterbox band, and travelled the world with the Chieftains, guesting with them wherever they played. Martin also played and recorded with such luminaries as accordionist Mairtin O’Connor, Mícheál Ó Súilleabháin, Bill Whelan and Liam Clancy amongst others. In 1993 he released his own album, A Dark Horse, in the company of Frankie Gavin, Matt Molloy, Derek Bell, Gary O’Briain, Seamus McGuire, Jimmy Faulkner, Mairtin O’Connor and more. 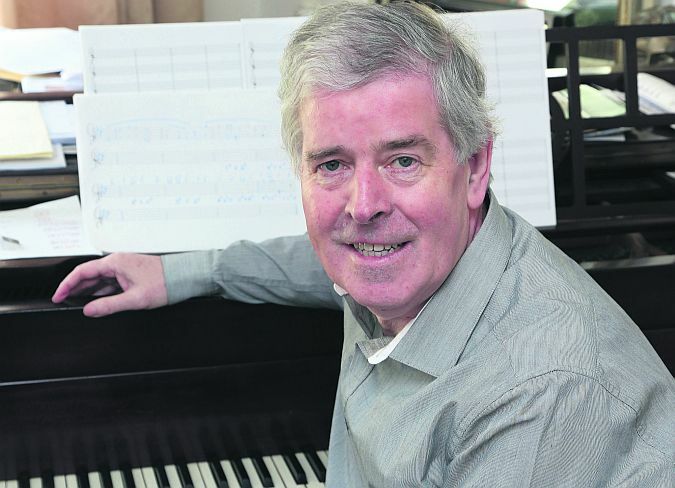 Carl Hession is a notable composer, arranger and pianist. Originally from Galway, he has All-Ireland titles to his credit as a soloist and as a member of duets and trios with flute player Matt Malloy and accordionist Joe Burke. He studied classical piano at University College, Cork where he completed a BA in music, specialising in keyboard improvisation. He played with the ceili band Shaskeen with whom he recorded several albums, and with band Moving Cloud. He has also worked with traditional musicians Frankie Gavin and Joe Derrane and, for several years he was part of the highly-successful Rhythm of the Dance team with the National Dance Company of Ireland. Together with Frankie Gavin, Carl has arranged all the brass and reed parts for this Roaring Twenties project.